Awesome choral sounds in a powerful interface, this is aimed mainly at the pro end of the market, in which it's a bargain. Superb choral sounds and textures. Flexible instruments. Excellent legato implementation. Creative 'builder' patches. Some presets require lots of RAM, necessitating 64-bit operation. Olympus combines Soundiron's Mars (male) and Venus (female) choir libraries, adding up to 45GB of Latin and Slavonic choral sounds recorded from a 30-voice male and a 33-voice female choir. "Sounds for each package come from two separate sessions and use performers from San Francisco's Choral Society, Symphonic Chorus and Volti Chamber Choir"
Sounds for each package come from two separate sessions, but both in the same location (San Francisco's Montclair Presbyterian Church), using performers from San Francisco's Choral Society, Symphonic Chorus and Volti Chamber Choir. A selection of Neumann mics were used to make the recording, in various stage and ambient positions, up to 75 feet away. These have been blended into two stereo aspects - stage and hall - so every patch comes in two variants. Olympus requires a full version of Native Instruments' Kontakt (v4 or later) and doesn't support NI's library format, so presets are open for user customisation. The interface includes Performance, Effects and Convolution tabs, plus an additional tab for the Phrase and Marcato Builder patches. The instrument presets total almost 700, with over 300 multis, the vast majority of which are for full chorus. However, there are also a number of solo presets using different soloists (two sopranos, three altos, two tenors and one bass). "What's impressive is that even in the most basic single articulation presets (staccato or marcato, say), presets are rarely just one-trick ponies"
Although the remit is very straightforward, the number of articulations and styles on offer give plenty of options. Sounds range from vowels and syllables, to more complete words in Latin and Russian. There are also melodic phrases, whispers, effects, ambiences and drones. However, what's impressive is that even in the most basic single articulation presets (staccato or marcato, say), presets are rarely just one-trick ponies. You might get to choose from 40 syllables (Staccato), say, or 11 Latin words (PolySustains Latin), each mapped out across the appropriate keyspan, using keyswitching or panel controls to select them. Beyond this, things get even more complex with the implementation of dual layers, which you blend using the X-Blend control (assigned to MIDI CC92). In presets such as PolySustains or Marcatos, you can even select which sounds are in each layer, opening up both creative and 'classic' combinations. Things probably reach maximum complexity with the Phrase Builder patches. Our favourite feature, though, is the legato function. Assuming you want to play a monophonic line, this uses true legato for smooth transitioning while retaining the integrity of the phrase. It works really well for smooth 'ahs' and 'ohs' in the legato presets, but is even more impressive in the Long PolySustains, where you can play the whole 'dominus' phrase, for example, changing pitch with each syllable. A number of patches come with further niceties that exploit Kontakt 5-specific features, including legato speed control and tempo-syncing. So, what's not so good? Well, while there are 'lite' versions, some of the full presets are absolutely enormous (1.5GB or more) and we found that they demanded 64-bit operation in our testing. Beyond that, although the libraries are great, if you're not producing soundtrack or atmospheric music, much of this stuff will be wasted on you. 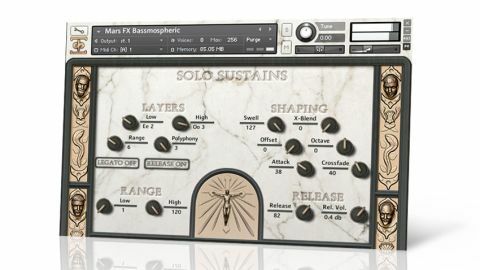 Those considerations aside, Venus and Mars are both beautifully produced sample-based instruments that take full advantage of Kontakt 5's powerful features.